Mass spectrometry (MS) is an analytical technique that ionizes chemical species and sorts the ions into a spectrum based on their mass-to-charge ratio. In simpler terms, a mass spectrum measures the masses within a sample. Mass spectrometry is used in many different fields and is applied to pure samples as well as complex mixtures. A mass spectrum is a plot of the ion signal as a function of the mass-to-charge ratio. These spectra are used to determine the elemental or isotopic signature of a sample, the masses of particles and of molecules, and to elucidate the chemical structures of molecules and other chemical compounds. In a typical MS procedure, a sample, which may be solid, liquid, or gas, is ionized, for example by bombarding it with electrons. This may cause some of the sample's molecules to break into charged fragments. These ions are then separated according to their mass-to-charge ratio, typically by accelerating them and subjecting them to an electric or magnetic field: ions of the same mass-to-charge ratio will undergo the same amount of deflection. The ions are detected by a mechanism capable of detecting charged particles, such as an electron multiplier. Results are displayed as spectra of the relative abundance of detected ions as a function of the mass-to-charge ratio. The atoms or molecules in the sample can be identified by correlating known masses (e.g. an entire molecule) to the identified masses or through a characteristic fragmentation pattern. In 1886, Eugen Goldstein observed rays in gas discharges under low pressure that traveled away from the anode and through channels in a perforated cathode, opposite to the direction of negatively charged cathode rays (which travel from cathode to anode). Goldstein called these positively charged anode rays "Kanalstrahlen"; the standard translation of this term into English is "canal rays". Wilhelm Wien found that strong electric or magnetic fields deflected the canal rays and, in 1899, constructed a device with perpendicular electric and magnetic fields that separated the positive rays according to their charge-to-mass ratio (Q/m). Wien found that the charge-to-mass ratio depended on the nature of the gas in the discharge tube. English scientist J.J. Thomson later improved on the work of Wien by reducing the pressure to create the mass spectrograph. The word spectrograph had become part of the international scientific vocabulary by 1884. Early spectrometry devices that measured the mass-to-charge ratio of ions were called mass spectrographs which consisted of instruments that recorded a spectrum of mass values on a photographic plate. 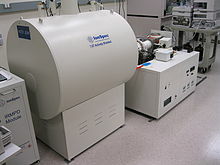 A mass spectroscope is similar to a mass spectrograph except that the beam of ions is directed onto a phosphor screen. A mass spectroscope configuration was used in early instruments when it was desired that the effects of adjustments be quickly observed. Once the instrument was properly adjusted, a photographic plate was inserted and exposed. The term mass spectroscope continued to be used even though the direct illumination of a phosphor screen was replaced by indirect measurements with an oscilloscope. The use of the term mass spectroscopy is now discouraged due to the possibility of confusion with light spectroscopy. 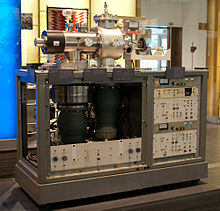 Mass spectrometry is often abbreviated as mass-spec or simply as MS.
Modern techniques of mass spectrometry were devised by Arthur Jeffrey Dempster and F.W. Aston in 1918 and 1919 respectively. 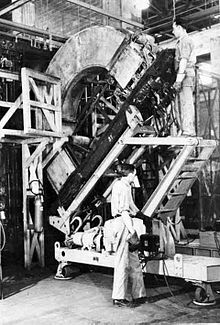 Sector mass spectrometers known as calutrons were developed by Ernest O. Lawrence and used for separating the isotopes of uranium during the Manhattan Project. Calutron mass spectrometers were used for uranium enrichment at the Oak Ridge, Tennessee Y-12 plant established during World War II. In 1989, half of the Nobel Prize in Physics was awarded to Hans Dehmelt and Wolfgang Paul for the development of the ion trap technique in the 1950s and 1960s. In 2002, the Nobel Prize in Chemistry was awarded to John Bennett Fenn for the development of electrospray ionization (ESI) and Koichi Tanaka for the development of soft laser desorption (SLD) and their application to the ionization of biological macromolecules, especially proteins. A mass spectrometer consists of three components: an ion source, a mass analyzer, and a detector. The ionizer converts a portion of the sample into ions. There is a wide variety of ionization techniques, depending on the phase (solid, liquid, gas) of the sample and the efficiency of various ionization mechanisms for the unknown species. An extraction system removes ions from the sample, which are then targeted through the mass analyzer and into the detector. The differences in masses of the fragments allows the mass analyzer to sort the ions by their mass-to-charge ratio. The detector measures the value of an indicator quantity and thus provides data for calculating the abundances of each ion present. Some detectors also give spatial information, e.g., a multichannel plate. The following example describes the operation of a spectrometer mass analyzer, which is of the sector type. (Other analyzer types are treated below.) Consider a sample of sodium chloride (table salt). In the ion source, the sample is vaporized (turned into gas) and ionized (transformed into electrically charged particles) into sodium (Na+) and chloride (Cl−) ions. Sodium atoms and ions are monoisotopic, with a mass of about 23 u. Chloride atoms and ions come in two isotopes with masses of approximately 35 u (at a natural abundance of about 75 percent) and approximately 37 u (at a natural abundance of about 25 percent). The analyzer part of the spectrometer contains electric and magnetic fields, which exert forces on ions traveling through these fields. The speed of a charged particle may be increased or decreased while passing through the electric field, and its direction may be altered by the magnetic field. The magnitude of the deflection of the moving ion's trajectory depends on its mass-to-charge ratio. Lighter ions get deflected by the magnetic force more than heavier ions (based on Newton's second law of motion, F = ma). The streams of sorted ions pass from the analyzer to the detector, which records the relative abundance of each ion type. This information is used to determine the chemical element composition of the original sample (i.e. that both sodium and chlorine are present in the sample) and the isotopic composition of its constituents (the ratio of 35Cl to 37Cl). In mass spectrometry, ionization refers to the production of gas phase ions suitable for resolution in the mass analyser or mass filter. Ionization occurs in the ion source. There are several ion sources available; each has advantages and disadvantages for particular applications. For example, electron ionization (EI) gives a high degree of fragmentation, yielding highly detailed mass spectra which when skilfully analysed can provide important information for structural elucidation/characterisation and facilitate identification of unknown compounds by comparison to mass spectral libraries obtained under identical operating conditions. However, EI is not suitable for coupling to HPLC, i.e. LC-MS, since at atmospheric pressure, the filaments used to generate electrons burn out rapidly. Thus EI is coupled predominantly with GC, i.e. GC-MS, where the entire system is under high vacuum..
Hard ionization techniques are processes which impart high quantities of residual energy in the subject molecule invoking large degrees of fragmentation (i.e. the systematic rupturing of bonds acts to remove the excess energy, restoring stability to the resulting ion). Resultant ions tend to have m/z lower than the molecular mass (other than in the case of proton transfer and not including isotope peaks). The most common example of hard ionization is electron ionization (EI). Soft ionization refers to the processes which impart little residual energy onto the subject molecule and as such result in little fragmentation. Examples include fast atom bombardment (FAB), chemical ionization (CI), atmospheric-pressure chemical ionization (APCI), electrospray ionization (ESI), and matrix-assisted laser desorption/ionization (MALDI). Inductively coupled plasma (ICP) sources are used primarily for cation analysis of a wide array of sample types. In this source, a plasma that is electrically neutral overall, but that has had a substantial fraction of its atoms ionized by high temperature, is used to atomize introduced sample molecules and to further strip the outer electrons from those atoms. The plasma is usually generated from argon gas, since the first ionization energy of argon atoms is higher than the first of any other elements except He, O, F and Ne, but lower than the second ionization energy of all except the most electropositive metals. The heating is achieved by a radio-frequency current passed through a coil surrounding the plasma. Photoionization can be used in experiments which seek to use mass spectrometry as a means of resolving chemical kinetics mechanisms and isomeric product branching. In such instances a high energy photon, either X-ray or uv, is used to dissociate stable gaseous molecules in a carrier gas of He or Ar. In instances where a synchrotron light source is utilized, a tuneable photon energy can be utilized to acquire a photoionization efficiency curve which can be used in conjunction with the charge ratio m/z to fingerprint molecular and ionic species. Others include glow discharge, field desorption (FD), fast atom bombardment (FAB), thermospray, desorption/ionization on silicon (DIOS), Direct Analysis in Real Time (DART), atmospheric pressure chemical ionization (APCI), secondary ion mass spectrometry (SIMS), spark ionization and thermal ionization (TIMS). There are several important analyser characteristics. The mass resolving power is the measure of the ability to distinguish two peaks of slightly different m/z. The mass accuracy is the ratio of the m/z measurement error to the true m/z. Mass accuracy is usually measured in ppm or milli mass units. The mass range is the range of m/z amenable to analysis by a given analyzer. The linear dynamic range is the range over which ion signal is linear with analyte concentration. Speed refers to the time frame of the experiment and ultimately is used to determine the number of spectra per unit time that can be generated. A sector field mass analyzer uses a static electric and/or magnetic field to affect the path and/or velocity of the charged particles in some way. As shown above, sector instruments bend the trajectories of the ions as they pass through the mass analyzer, according to their mass-to-charge ratios, deflecting the more charged and faster-moving, lighter ions more. The analyzer can be used to select a narrow range of m/z or to scan through a range of m/z to catalog the ions present. The time-of-flight (TOF) analyzer uses an electric field to accelerate the ions through the same potential, and then measures the time they take to reach the detector. If the particles all have the same charge, the kinetic energies tends to be identical, and their velocities, in this case, will depend only on their masses. Ions with a lower mass will reach the detector first. However, in reality, even particles with the same m/z can arrive at different times at the detector, because they have different initial velocities. The initial velocity is not dependent on the mass of the ion what becomes a problem for the TOF-MS. The difference in initial velocity turns into difference in the final velocity. In this way, ions with the same m/z are going to arrive at different times in the detector. For fixing this problem, time-lag focusing/delayed extraction has been coupled with TOF-MS.
Quadrupole mass analyzers use oscillating electrical fields to selectively stabilize or destabilize the paths of ions passing through a radio frequency (RF) quadrupole field created between 4 parallel rods. Only the ions in a certain range of mass/charge ratio are passed through the system at any time, but changes to the potentials on the rods allow a wide range of m/z values to be swept rapidly, either continuously or in a succession of discrete hops. A quadrupole mass analyzer acts as a mass-selective filter and is closely related to the quadrupole ion trap, particularly the linear quadrupole ion trap except that it is designed to pass the untrapped ions rather than collect the trapped ones, and is for that reason referred to as a transmission quadrupole. A magnetically enhanced quadrupole mass analyzer includes the addition of a magnetic field, either applied axially or transversely. This novel type of instrument leads to an additional performance enhancement in terms of resolution and/or sensitivity depending upon the magnitude and orientation of the applied magnetic field. A common variation of the transmission quadrupole is the triple quadrupole mass spectrometer. The “triple quad” has three consecutive quadrupole stages, the first acting as a mass filter to transmit a particular incoming ion to the second quadrupole, a collision chamber, wherein that ion can be broken into fragments. The third quadrupole also acts as a mass filter, to transmit a particular fragment ion to the detector. If a quadrupole is made to rapidly and repetitively cycle through a range of mass filter settings, full spectra can be reported. Likewise, a triple quad can be made to perform various scan types characteristic of tandem mass spectrometry. The cylindrical ion trap mass spectrometer (CIT) is a derivative of the quadrupole ion trap where the electrodes are formed from flat rings rather than hyperbolic shaped electrodes. The architecture lends itself well to miniaturization because as the size of a trap is reduced, the shape of the electric field near the center of the trap, the region where the ions are trapped, forms a shape similar to that of a hyperbolic trap. As with the toroidal trap, linear traps and 3D quadrupole ion traps are the most commonly miniaturized mass analyzers due to their high sensitivity, tolerance for mTorr pressure, and capabilities for single analyzer tandem mass spectrometry (e.g. product ion scans). Orbitrap instruments are similar to Fourier transform ion cyclotron resonance mass spectrometers (see text below). Ions are electrostatically trapped in an orbit around a central, spindle shaped electrode. The electrode confines the ions so that they both orbit around the central electrode and oscillate back and forth along the central electrode's long axis. This oscillation generates an image current in the detector plates which is recorded by the instrument. The frequencies of these image currents depend on the mass-to-charge ratios of the ions. Mass spectra are obtained by Fourier transformation of the recorded image currents. Orbitraps have a high mass accuracy, high sensitivity and a good dynamic range. Fourier transform mass spectrometry (FTMS), or more precisely Fourier transform ion cyclotron resonance MS, measures mass by detecting the image current produced by ions cyclotroning in the presence of a magnetic field. Instead of measuring the deflection of ions with a detector such as an electron multiplier, the ions are injected into a Penning trap (a static electric/magnetic ion trap) where they effectively form part of a circuit. Detectors at fixed positions in space measure the electrical signal of ions which pass near them over time, producing a periodic signal. Since the frequency of an ion's cycling is determined by its mass-to-charge ratio, this can be deconvoluted by performing a Fourier transform on the signal. FTMS has the advantage of high sensitivity (since each ion is "counted" more than once) and much higher resolution and thus precision. Typically, some type of electron multiplier is used, though other detectors including Faraday cups and ion-to-photon detectors are also used. Because the number of ions leaving the mass analyzer at a particular instant is typically quite small, considerable amplification is often necessary to get a signal. Microchannel plate detectors are commonly used in modern commercial instruments. In FTMS and Orbitraps, the detector consists of a pair of metal surfaces within the mass analyzer/ion trap region which the ions only pass near as they oscillate. No direct current is produced, only a weak AC image current is produced in a circuit between the electrodes. Other inductive detectors have also been used. When a specific combination of source, analyzer, and detector becomes conventional in practice, a compound acronym may arise to designate it succinctly. One example is MALDI-TOF, which refers to a combination of a matrix-assisted laser desorption/ionization source with a time-of-flight mass analyzer. Other examples include inductively coupled plasma-mass spectrometry (ICP-MS), accelerator mass spectrometry (AMS), thermal ionization-mass spectrometry (TIMS) and spark source mass spectrometry (SSMS). An important enhancement to the mass resolving and mass determining capabilities of mass spectrometry is using it in tandem with chromatographic and other separation techniques. Similar to gas chromatography MS (GC-MS), liquid chromatography-mass spectrometry (LC/MS or LC-MS) separates compounds chromatographically before they are introduced to the ion source and mass spectrometer. It differs from GC-MS in that the mobile phase is liquid, usually a mixture of water and organic solvents, instead of gas. Most commonly, an electrospray ionization source is used in LC-MS. Other popular and commercially available LC-MS ion sources are atmospheric pressure chemical ionization and atmospheric pressure photoionization. There are also some newly developed ionization techniques like laser spray. Capillary electrophoresis–mass spectrometry (CE-MS) is a technique that combines the liquid separation process of capillary electrophoresis with mass spectrometry. CE-MS is typically coupled to electrospray ionization. Ion mobility spectrometry-mass spectrometry (IMS/MS or IMMS) is a technique where ions are first separated by drift time through some neutral gas under an applied electrical potential gradient before being introduced into a mass spectrometer. Drift time is a measure of the radius relative to the charge of the ion. The duty cycle of IMS (the time over which the experiment takes place) is longer than most mass spectrometric techniques, such that the mass spectrometer can sample along the course of the IMS separation. This produces data about the IMS separation and the mass-to-charge ratio of the ions in a manner similar to LC-MS.
Certain types of mass spectrometry data are best represented as a mass chromatogram. Types of chromatograms include selected ion monitoring (SIM), total ion current (TIC), and selected reaction monitoring (SRM), among many others. Mass spectrometry data analysis is specific to the type of experiment producing the data. General subdivisions of data are fundamental to understanding any data. Knowledge of the origin of a sample can provide insight into the component molecules of the sample and their fragmentations. A sample from a synthesis/manufacturing process will probably contain impurities chemically related to the target component. A crudely prepared biological sample will probably contain a certain amount of salt, which may form adducts with the analyte molecules in certain analyses. Results can also depend heavily on sample preparation and how it was run/introduced. An important example is the issue of which matrix is used for MALDI spotting, since much of the energetics of the desorption/ionization event is controlled by the matrix rather than the laser power. Sometimes samples are spiked with sodium or another ion-carrying species to produce adducts rather than a protonated species. Mass spectrometry can measure molar mass, molecular structure, and sample purity. Each of these questions requires a different experimental procedure; therefore, adequate definition of the experimental goal is a prerequisite for collecting the proper data and successfully interpreting it. Since the precise structure or peptide sequence of a molecule is deciphered through the set of fragment masses, the interpretation of mass spectra requires combined use of various techniques. Usually the first strategy for identifying an unknown compound is to compare its experimental mass spectrum against a library of mass spectra. If no matches result from the search, then manual interpretation or software assisted interpretation of mass spectra must be performed. Computer simulation of ionization and fragmentation processes occurring in mass spectrometer is the primary tool for assigning structure or peptide sequence to a molecule. An a priori structural information is fragmented in silico and the resulting pattern is compared with observed spectrum. Such simulation is often supported by a fragmentation library that contains published patterns of known decomposition reactions. Software taking advantage of this idea has been developed for both small molecules and proteins. Analysis of mass spectra can also be spectra with accurate mass. A mass-to-charge ratio value (m/z) with only integer precision can represent an immense number of theoretically possible ion structures; however, more precise mass figures significantly reduce the number of candidate molecular formulas. A computer algorithm called formula generator calculates all molecular formulas that theoretically fit a given mass with specified tolerance. A recent technique for structure elucidation in mass spectrometry, called precursor ion fingerprinting, identifies individual pieces of structural information by conducting a search of the tandem spectra of the molecule under investigation against a library of the product-ion spectra of structurally characterized precursor ions. Mass spectrometry has both qualitative and quantitative uses. These include identifying unknown compounds, determining the isotopic composition of elements in a molecule, and determining the structure of a compound by observing its fragmentation. Other uses include quantifying the amount of a compound in a sample or studying the fundamentals of gas phase ion chemistry (the chemistry of ions and neutrals in a vacuum). MS is now commonly used in analytical laboratories that study physical, chemical, or biological properties of a great variety of compounds. As an analytical technique it possesses distinct advantages such as: Increased sensitivity over most other analytical techniques because the analyzer, as a mass-charge filter, reduces background interference, Excellent specificity from characteristic fragmentation patterns to identify unknowns or confirm the presence of suspected compounds, Information about molecular weight, Information about the isotopic abundance of elements, Temporally resolved chemical data. A few of the disadvantages of the method is that it often fails to distinguish between optical and geometrical isomers and the positions of substituent in o-, m- and p- positions in an aromatic ring. Also, its scope is limited in identifying hydrocarbons that produce similar fragmented ions. Membrane-inlet Mass Spectrometry, combines the Isotope ratio MS with a reaction chamber/cell separated by a gas-permeable membrane. This method allows the study of gasses as they evolve in solution. This method has been extensively used for the study of the production of oxygen by Photosystem II. An atom probe is an instrument that combines time-of-flight mass spectrometry and field-evaporation microscopy to map the location of individual atoms. Mass spectrometry is an important method for the characterization and sequencing of proteins. The two primary methods for ionization of whole proteins are electrospray ionization (ESI) and matrix-assisted laser desorption/ionization (MALDI). In keeping with the performance and mass range of available mass spectrometers, two approaches are used for characterizing proteins. In the first, intact proteins are ionized by either of the two techniques described above, and then introduced to a mass analyzer. This approach is referred to as "top-down" strategy of protein analysis. The top-down approach however is largely limited to low-throughput single-protein studies. In the second, proteins are enzymatically digested into smaller peptides using proteases such as trypsin or pepsin, either in solution or in gel after electrophoretic separation. Other proteolytic agents are also used. The collection of peptide products are then introduced to the mass analyzer. When the characteristic pattern of peptides is used for the identification of the protein the method is called peptide mass fingerprinting (PMF), if the identification is performed using the sequence data determined in tandem MS analysis it is called de novo peptide sequencing. These procedures of protein analysis are also referred to as the "bottom-up" approach. A third approach however is beginning to be used, this intermediate "middle-down" approach involves analyzing proteolytic peptide larger than the typical tryptic peptide. As a standard method for analysis, mass spectrometers have reached other planets and moons. Two were taken to Mars by the Viking program. In early 2005 the Cassini–Huygens mission delivered a specialized GC-MS instrument aboard the Huygens probe through the atmosphere of Titan, the largest moon of the planet Saturn. This instrument analyzed atmospheric samples along its descent trajectory and was able to vaporize and analyze samples of Titan's frozen, hydrocarbon covered surface once the probe had landed. These measurements compare the abundance of isotope(s) of each particle comparatively to earth's natural abundance. Also on board the Cassini–Huygens spacecraft was an ion and neutral mass spectrometer which had been taking measurements of Titan's atmospheric composition as well as the composition of Enceladus' plumes. A Thermal and Evolved Gas Analyzer mass spectrometer was carried by the Mars Phoenix Lander launched in 2007. Mass spectrometers are also widely used in space missions to measure the composition of plasmas. For example, the Cassini spacecraft carried the Cassini Plasma Spectrometer (CAPS), which measured the mass of ions in Saturn's magnetosphere. The primary function of mass spectrometry is as a tool for chemical analyses based on detection and quantification of ions according to their mass-to-charge ratio. However, mass spectrometry also shows promise for material synthesis. Ion soft landing is characterized by deposition of intact species on surfaces at low kinetic energies which precludes the fragmentation of the incident species. The soft landing technique was first reported in 1977 for the reaction of low energy sulfur containing ions on a lead surface. ^ a b c Sparkman, O. David (2000). Mass spectrometry desk reference. Pittsburgh: Global View Pub. ISBN 978-0-9660813-2-9. ^ "Definition of spectrograph[permanent dead link]." Merriam Webster. Accessed 13 June 2008. ^ Downard, Kevin (2004). Mass Spectrometry - A Foundation Course. Royal Society of Chemistry. doi:10.1039/9781847551306. ISBN 978-0-85404-609-6. ^ Downard KM (2007). "Historical account: Francis William Aston: the man behind the mass spectrograph". European Journal of Mass Spectrometry. 13 (3): 177–90. doi:10.1255/ejms.878. PMID 17881785. ^ Thomson, J.J. (1913). Rays Of Positive Electricity and Their Application to Chemical Analysis. London: Longman's Green and Company. ^ Siri, William (1947). "Mass spectroscope for analysis in the low-mass range". Review of Scientific Instruments. 18 (8): 540–545. Bibcode:1947RScI...18..540S. doi:10.1063/1.1740998. ^ Price P (August 1991). "Standard definitions of terms relating to mass spectrometry : A report from the committee on measurements and standards of the American society for mass spectrometry". Journal of the American Society for Mass Spectrometry. 2 (4): 336–48. doi:10.1016/1044-0305(91)80025-3. PMID 24242353. ^ Parkins, William E. (2005). "The uranium bomb, the calutron, and the space-charge problem". Physics Today. 58 (5): 45–51. Bibcode:2005PhT....58e..45P. CiteSeerX 10.1.1.579.4119. doi:10.1063/1.1995747. ISSN 0031-9228. ^ "The Nobel Prize in Chemistry 2002: Information for the Public". The Nobel Foundation. 9 October 2002. Retrieved 2007-08-29. ^ Fenn JB, Mann M, Meng CK, Wong SF, Whitehouse CM (October 1989). "Electrospray ionization for mass spectrometry of large biomolecules". Science. 246 (4926): 64–71. Bibcode:1989Sci...246...64F. CiteSeerX 10.1.1.522.9458. doi:10.1126/science.2675315. PMID 2675315. ^ Tanaka K, Waki H, Ido Y, Akita S, Yoshida Y, Yoshida T (1988). "Protein and Polymer Analyses up to m/z 100 000 by Laser Ionization Time-of flight Mass Spectrometry". Rapid Commun Mass Spectrom. 2 (20): 151–3. Bibcode:1988RCMS....2..151T. doi:10.1002/rcm.1290020802. ^ Karas M, Bachman D, Bahr U, Hillenkamp F (1987). "Matrix-Assisted Ultraviolet Laser Desorption of Non-Volatile Compounds". Int J Mass Spectrom Ion Proc. 78: 53–68. Bibcode:1987IJMSI..78...53K. doi:10.1016/0168-1176(87)87041-6. ^ Osborn DL, Zou P, Johnsen H, Hayden CC, Taatjes CA, Knyazev VD, North SW, Peterka DS, Ahmed M, Leone SR (October 2008). "The multiplexed chemical kinetic photoionization mass spectrometer: a new approach to isomer-resolved chemical kinetics". Review of Scientific Instruments (Submitted manuscript). 79 (10): 104103–104103–10. Bibcode:2008RScI...79j4103O. doi:10.1063/1.3000004. PMID 19044733. ^ Bruins, A. P. (1991). "Mass spectrometry with ion sources operating at atmospheric pressure". Mass Spectrometry Reviews. 10 (1): 53–77. Bibcode:1991MSRv...10...53B. doi:10.1002/mas.1280100104. ^ Cottrell JS, Greathead RJ (1986). "Extending the Mass Range of a Sector Mass Spectrometer". Mass Spectrometry Reviews. 5 (3): 215–247. Bibcode:1986MSRv....5..215C. doi:10.1002/mas.1280050302. ^ In the event that the ions do not start at identical kinetic energies, some ions may lag behind higher kinetic energy ions decreasing resolution. Reflectron geometries are commonly employed to correct this problem. Wollnik, H. (1993). 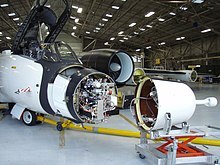 "Time-of-flight mass analyzers". Mass Spectrometry Reviews. 12 (2): 89–114. Bibcode:1993MSRv...12...89W. doi:10.1002/mas.1280120202. ^ Guilhaus, Michae (1998). "Principles and Instrumentation in Time-of-flight Mass Spectrometry" (PDF). Journal of Mass Spectrometry. 30 (11): 1519–1532. doi:10.1002/jms.1190301102 – via Google Scholar. ^ Syed SU, Maher S, Taylor S (December 2013). "Quadrupole mass filter operation under the influence of magnetic field". Journal of Mass Spectrometry. 48 (12): 1325–39. Bibcode:2013JMSp...48.1325S. doi:10.1002/jms.3293. PMID 24338888. ^ Maher S, Syed SU, Hughes DM, Gibson JR, Taylor S (August 2013). "Mapping the stability diagram of a quadrupole mass spectrometer with a static transverse magnetic field applied". Journal of the American Society for Mass Spectrometry. 24 (8): 1307–14. Bibcode:2013JASMS..24.1307M. doi:10.1007/s13361-013-0654-5. PMID 23720050. ^ Paul W, Steinwedel H (1953). "Ein neues Massenspektrometer ohne Magnetfeld". Zeitschrift für Naturforschung A. 8 (7): 448–450. Bibcode:1953ZNatA...8..448P. doi:10.1515/zna-1953-0710. ^ March RE (2000). "Quadrupole ion trap mass spectrometry: a view at the turn of the century". International Journal of Mass Spectrometry. 200 (1–3): 285–312. Bibcode:2000IJMSp.200..285M. doi:10.1016/S1387-3806(00)00345-6. ^ Schwartz JC, Senko MW, Syka JE (June 2002). "A two-dimensional quadrupole ion trap mass spectrometer". Journal of the American Society for Mass Spectrometry. 13 (6): 659–69. doi:10.1016/S1044-0305(02)00384-7. PMID 12056566. ^ Lammert SA, Rockwood AA, Wang M, Lee ML, Lee ED, Tolley SE, Oliphant JR, Jones JL, Waite RW (July 2006). "Miniature toroidal radio frequency ion trap mass analyzer". Journal of the American Society for Mass Spectrometry. 17 (7): 916–922. doi:10.1016/j.jasms.2006.02.009. PMID 16697659. ^ Snyder DT, Pulliam CJ, Ouyang Z, Cooks RG (January 2016). "Miniature and Fieldable Mass Spectrometers: Recent Advances". Analytical Chemistry. 88 (1): 2–29. doi:10.1021/acs.analchem.5b03070. PMC 5364034. PMID 26422665. ^ Hu Q, Noll RJ, Li H, Makarov A, Hardman M, Graham Cooks R (April 2005). "The Orbitrap: a new mass spectrometer". Journal of Mass Spectrometry. 40 (4): 430–43. Bibcode:2005JMSp...40..430H. doi:10.1002/jms.856. PMID 15838939. ^ Comisarow MB, Marshall AG (1974). "Fourier transform ion cyclotron resonance spectroscopy". Chemical Physics Letters. 25 (2): 282–283. Bibcode:1974CPL....25..282C. doi:10.1016/0009-2614(74)89137-2. ^ Marshall AG, Hendrickson CL, Jackson GS (1998). "Fourier transform ion cyclotron resonance mass spectrometry: a primer". Mass Spectrometry Reviews. 17 (1): 1–35. Bibcode:1998MSRv...17....1M. doi:10.1002/(SICI)1098-2787(1998)17:1<1::AID-MAS1>3.0.CO;2-K. PMID 9768511. ^ Dubois F, Knochenmuss R, Zenobi R, Brunelle A, Deprun C, Le Beyec Y (1999). "A comparison between ion-to-photon and microchannel plate detectors". Rapid Communications in Mass Spectrometry. 13 (9): 786–791. doi:10.1002/(SICI)1097-0231(19990515)13:9<786::AID-RCM566>3.0.CO;2-3. ^ Park MA, Callahan JH, Vertes A (1994). "An inductive detector for time-of-flight mass spectrometry". Rapid Communications in Mass Spectrometry. 8 (4): 317–322. Bibcode:1994RCMS....8..317P. doi:10.1002/rcm.1290080407. ^ Boyd, Robert K. (1994). "Linked-scan techniques for MS/MS using tandem-in-space instruments". Mass Spectrometry Reviews. 13 (5–6): 359–410. Bibcode:1994MSRv...13..359B. doi:10.1002/mas.1280130502. ^ Loo JA, Udseth HR, Smith RD (June 1989). "Peptide and protein analysis by electrospray ionization-mass spectrometry and capillary electrophoresis-mass spectrometry". Analytical Biochemistry. 179 (2): 404–12. doi:10.1016/0003-2697(89)90153-X. PMID 2774189. ^ Maxwell EJ, Chen DD (October 2008). "Twenty years of interface development for capillary electrophoresis-electrospray ionization-mass spectrometry". Analytica Chimica Acta. 627 (1): 25–33. doi:10.1016/j.aca.2008.06.034. PMID 18790125. ^ Verbeck GF, Ruotolo BT, Sawyer HA, Gillig KJ, Russell DH (June 2002). "A fundamental introduction to ion mobility mass spectrometry applied to the analysis of biomolecules". Journal of Biomolecular Techniques. 13 (2): 56–61. PMC 2279851. PMID 19498967. ^ Matz LM, Asbury GR, Hill HH (2002). "Two-dimensional separations with electrospray ionization ambient pressure high-resolution ion mobility spectrometry/quadrupole mass spectrometry". Rapid Communications in Mass Spectrometry. 16 (7): 670–5. Bibcode:2002RCMS...16..670M. doi:10.1002/rcm.623. PMID 11921245. ^ Sowell RA, Koeniger SL, Valentine SJ, Moon MH, Clemmer DE (September 2004). "Nanoflow LC/IMS-MS and LC/IMS-CID/MS of protein mixtures". Journal of the American Society for Mass Spectrometry. 15 (9): 1341–53. doi:10.1016/j.jasms.2004.06.014. PMID 15337515. ^ Tureček F, McLafferty FW (1993). Interpretation of mass spectra. Sausalito: University Science Books. ISBN 978-0-935702-25-5. ^ Sheldon MT, Mistrik R, Croley TR (March 2009). "Determination of ion structures in structurally related compounds using precursor ion fingerprinting". Journal of the American Society for Mass Spectrometry. 20 (3): 370–6. doi:10.1016/j.jasms.2008.10.017. PMID 19041260. ^ a b Maher S, Jjunju FP, Taylor S (2015). "100 years of mass spectrometry: Perspectives and future trends". Rev. Mod. Phys. 87 (1): 113–135. Bibcode:2015RvMP...87..113M. doi:10.1103/RevModPhys.87.113. ^ Shevela D, Messinger J (November 2013). "Studying the oxidation of water to molecular oxygen in photosynthetic and artificial systems by time-resolved membrane-inlet mass spectrometry". Frontiers in Plant Science. 4: 473. doi:10.3389/fpls.2013.00473. PMC 3840314. PMID 24324477. ^ Petrie S & Bohme DK (2007). "Ions in space". Mass Spectrometry Reviews. 26 (2): 258–80. Bibcode:2007MSRv...26..258P. doi:10.1002/mas.20114. PMID 17111346. ^ Hoffman JH, Chaney RC, Hammack H (October 2008). "Phoenix Mars Mission--the thermal evolved gas analyzer". Journal of the American Society for Mass Spectrometry. 19 (10): 1377–83. doi:10.1016/j.jasms.2008.07.015. PMID 18715800. ^ "Cassini Plasma Spectrometer". Southwest Research Institute. Retrieved 2008-01-04. ^ Riker JB, Haberman B (1976). "Expired gas monitoring by mass spectrometry in a respiratory intensive care unit". Critical Care Medicine. 4 (5): 223–9. doi:10.1097/00003246-197609000-00002. PMID 975846. ^ Gothard JW, Busst CM, Branthwaite MA, Davies NJ, Denison DM (September 1980). "Applications of respiratory mass spectrometry to intensive care". Anaesthesia. 35 (9): 890–5. doi:10.1111/j.1365-2044.1980.tb03950.x. PMID 6778243. ^ Verbeck G, Hoffmann W, Walton B (October 2012). "Soft-landing preparative mass spectrometry". The Analyst. 137 (19): 4393–407. Bibcode:2012Ana...137.4393V. doi:10.1039/C2AN35550G. PMID 22900257. ^ Franchetti V, Solka BH, Baitinger WE, Amy JW, Cooks RG (1977). "Soft landing of ions as a means of surface modification". Mass Spectrom. Ion Phys. 23 (1): 29–35. Bibcode:1977IJMSI..23...29F. doi:10.1016/0020-7381(77)80004-1. Tureček F, McLafferty FW (1993). Interpretation of mass spectra. Sausalito, Calif: University Science Books. ISBN 978-0-935702-25-5.
de Hoffman E, Stroobant V (2001). Mass Spectrometry: Principles and Applications (2nd ed.). John Wiley and Sons. ISBN 978-0-471-48566-7. Downard K (2004). Mass Spectrometry – A Foundation Course. Cambridge UK: Royal Society of Chemistry. ISBN 978-0-85404-609-6. Siuzdak G (1996). Mass spectrometry for biotechnology. Boston: Academic Press. ISBN 978-0-12-647471-8. Dass C (2001). Principles and practice of biological mass spectrometry. New York: John Wiley. ISBN 978-0-471-33053-0. Muzikar P, et al. (2003). "Accelerator Mass Spectrometry in Geologic Research". Geological Society of America Bulletin. 115: 643–654. Bibcode:2003GSAB..115..643M. doi:10.1130/0016-7606(2003)115<0643:AMSIGR>2.0.CO;2. ISSN 0016-7606. Maher S, Jjunju FP, Taylor S (2015). "100 years of mass spectrometry: Perspectives and future trends". Rev. Mod. Phys. 87 (1): 113–135. Bibcode:2015RvMP...87..113M. doi:10.1103/RevModPhys.87.113. Sobott F (2014). Biological Mass Spectrometry. Boca Raton: Crc Pr I Llc. ISBN 978-1439895276. Sparkman OD (2006). Mass Spectrometry Desk Reference. Pittsburgh: Global View Pub. ISBN 978-0-9660813-9-8. Watson JT, Sparkman OD (2007). Introduction to Mass Spectrometry: Instrumentatio, Applications, and Strategies for Data Interpretation (4th ed.). Chichester: Jonh Wiley & Sons. ISBN 978-0-470-51634-8. Tuniz C (1998). Accelerator mass spectrometry: ultrasensitive analysis for global science. Boca Raton: CRC Press. ISBN 978-0-8493-4538-8. Kandiah M, Urban PL (June 2013). "Advances in ultrasensitive mass spectrometry of organic molecules". Chemical Society Reviews. 42 (12): 5299–322. doi:10.1039/c3cs35389c. PMID 23471277. 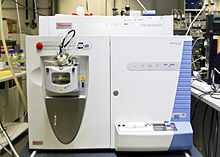 Wikimedia Commons has media related to Mass spectrometry. 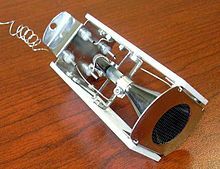 Look up mass spectrometry in Wiktionary, the free dictionary.